This post is going to be short and sweet. 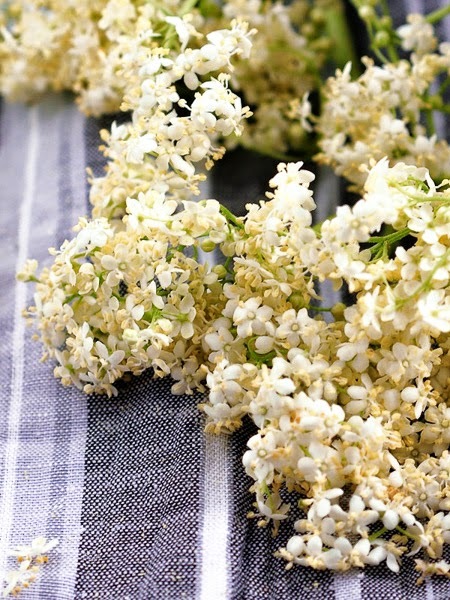 Sweet like the syrup I made from the white flowers of an elderberry tree. 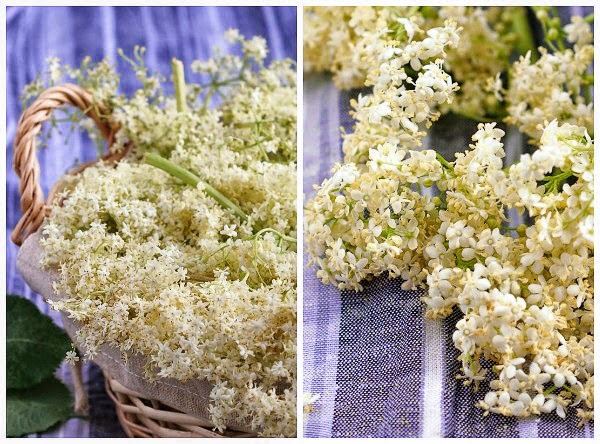 Elderflowers are very special to me. They remind me of spring in London and are in a way responsible for getting me hooked on following food blogs and ultimately starting my own. 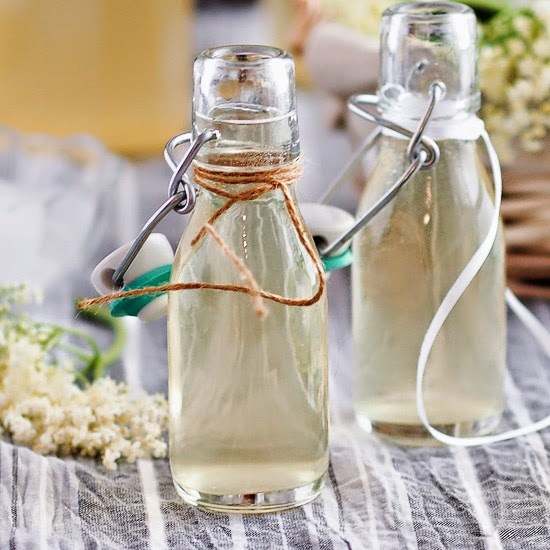 You see, I don't drink coffee and a cold glass of Elderflower Cordial (a light syrup infused with the aroma of the flowers and diluted with water) was the best alternative to tea, especially on sunny spring and summer afternoons. I missed them while we lived in Riyadh. 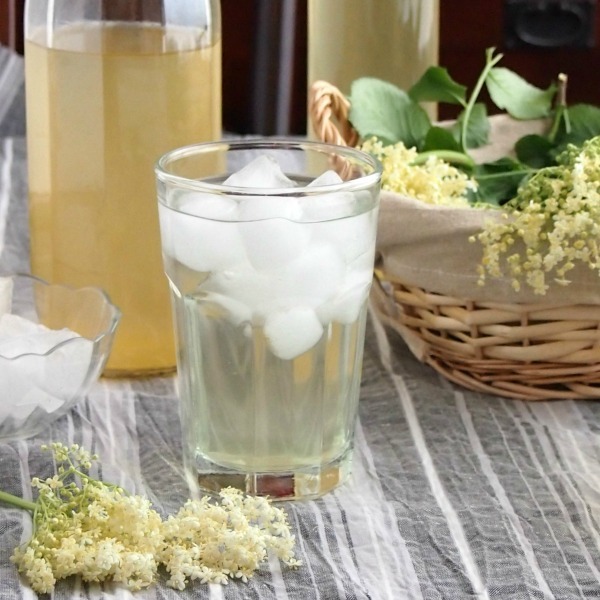 The elderberry bush only grows in Northern and Central Europe and Northwest Africa. But I found them again when we came to Zagreb. It was late spring, almost five years ago, and after a harsh winter Zagreb was flowering all over. I was also starting to heal after two lower back operations and for the first time in a long and difficult period I was starting to feel good with myself. The mere fact that I was able to sit on a chair without pain for more than 15 minutes made me feel happy and timidly optimistic. I still had to go to my daily physiotherapy session but I could now get on the tram and go on my own instead of being driven there. The physiotherapy clinic was (and still is) on top of small hill overlooking the north part of Zagreb. I liked walking up there every morning and even though most of the times I arrived completely out of breath I enjoyed the walk uphill. I noticed the trees and the flowers, trying to guess their kind and marking their changes as the weeks went by. One day I noticed a leafy bush, tacked behind two acacia trees. It was almost hidden from view but I could smell the elegant honey and citrus aroma of its white blooms. It was a flowering young elderberry bush. When I went home I looked online for a way to make the syrup myself. I found dozens of posts with recipes and lovely pictures of the flowers. Up until then I had had no idea that there were so many people writing about food on the Internet. It was like a whole new world had opened for me; a place where I could read about food from people who were not professional and intimidating chefs, where they were sharing their experiences not only about food but also about their lives. I could relate to many of them and soon I found myself following and reading many more until one day, about a year later, I started my own. 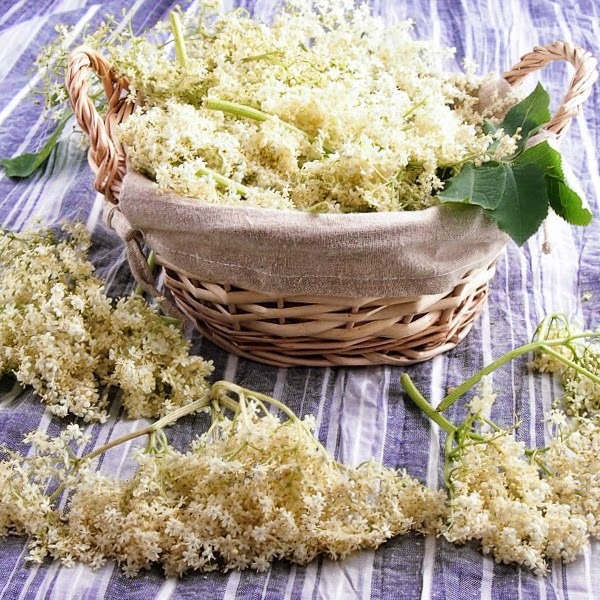 Elderflowers are in season from May until the beginning of June. This year they started a little earlier in Zagreb and I was able to pick a few and make a small quantity of syrup in mid April when I made the Lemon & Elderflower Bundt Cake. 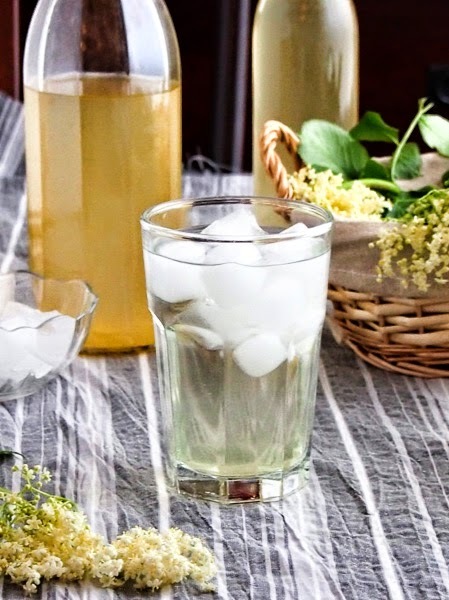 I did not have time then to take pictures and post the cordial recipe together with the cake. But thankfully they are still in full bloom so I went and gathered a few more and made more syrup for me to keep and give to friends. I said that this was going to be a short post so please excuse my blabbering and let's move on with the recipe. 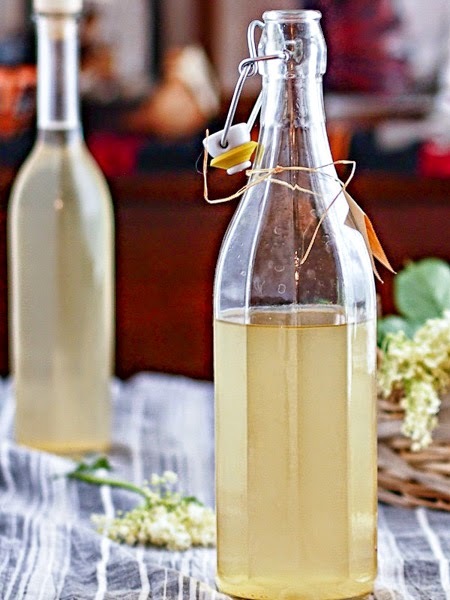 Rinse the elderflowers under cold water to remove any dirt or small bugs. Be very gentle. Put the sugar in a very large mixing bowl (at least 2.5 litres capacity). Pour the boiling water over the the sugar. Stir well and leave it to cool. Add the citric acid, the orange and lemons slices and then the flowers. Cover loosely with plastic wrap and leave the bowl to rest in a cool place for 24 hours. Strain the liquid using a double cheese cloth or a piece of muslin fabric. Transfer the syrup to sterilised bottles. You can find citric acid in pharmacies or online here . 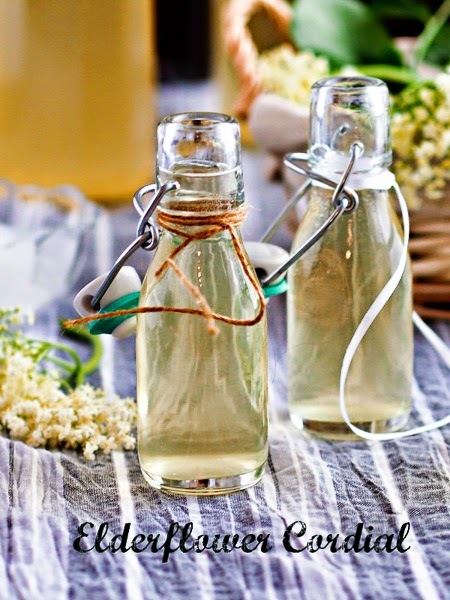 Dilute the syrup with cold sparkling water for a light afternoon drink or use it in your cocktails -it's great with Gin and Vodka. Πλένουμε τα λουλούδια, με προσοχή, κάτω από κρύο τρεχούμενο νερό για να απομακρύνουμε τυχών βρωμιές ή ζουζούνια. Βάζουμε τη ζάχαρη σε ένα πολύ μεγάλο μπολ ή μικρή λεκανίτσα που να χωράει τουλάχιστον 2.5 λίτρα. Ρίχνουμε το βραστό νερό στη ζάχαρη. Ανακατέβουμε καλά και αφήνουμε να κρυώσει. Προσθέτουμε το κιτρικό οξύ, τις φέτες πορτοκαλιών και λεμονιών και τέλος τα λουλούδια. Καλύπτουμε το μπολ με μεμβράνη και το αφήνουμε σε δροσερό μέρος για 24 ώρες. Στραγγίζουμε το υγρό με ένα κομμάτι μουσελίνας. Μεταφέρουμε το σιρόπι σε αποστειρωμένα μπουκάλια. Διαλύουμε το σιρόπι με μεταλλικό νερό ή το χρησιμοποιούμε για να αρωματίσουμε τα καλοκαιρινά μας cocktails.